Wings are a messy, delicious, and affordable—a great social food. Whether you like your wings fried, smoked, or battered, Mississippi has some great choices. These are our picks for the 10 best wing places in the state! Murky Waters is a laid-back barbeque joint in downtown Gulfport, with an outdoor patio that opens onto popular Fishbone Alley. Murky Waters' wings are first smoked then flash fried for a subtle, unique flavor with plenty of sauce options. Enjoy live music and craft beer with your wings! 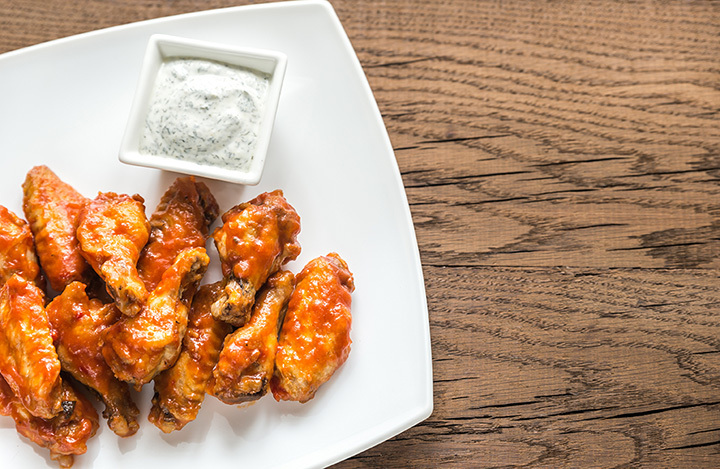 Memphis is known for being a town with great food, so it's no surprised that some of the best wings in Mississippi are right along the northern border. At Friars Wings in Hernando, you can choose between classic, boneless, or whole wings, and they make all of their sauces in-house from scratch. Bim Bam's started as Christy's Restaurant, but the owners decided to rebrand when they purchased the restaurant in 2013. Today, they're known for their delicious burgers as well as for serving the freshest wings around, and they've opened four locations across North Mississippi. It may seem unlikely that a seafood restaurant has some of the best wings on the coast, but they do. Blazin' Cajun Seafood in Gulfport has wings which are breaded and then fried, and they're always crisp and juicy. Dip them in your choice of ranch or hot sauce, or just enjoy them plain. The Wing King in Jackson is a perfect example of doing one thing very well. Their wings get rave reviews from customers, many of whom proclaim them the best in the city. There's only one way to find out—grab an order for yourself! If you like it hot, try the Janky Sauce! With 11 flavors of hot wings, you know you're going to find something you love at One Stop Wings and Poboys in Moss Point. The owners take pride in providing consistently great food with excellent customer service, all with a Cajun twist. Sit and enjoy your food in the cozy restaurant or call ahead for take-out. American Wings is widely considered to have the best wings in Hattiesburg. Located on busy Hardy Street, they're a hit with college students from the nearby University of Southern Mississippi. For added convenience, you can even place to-go orders from their website! Old School Hot Wings on Highway 61 in Walls is the kind of tucked-away place you only find in the Delta—the kind of place where you always find the best food. They serve whole wings here, not cut-up portions, and they attract customers from all around the area—even Memphis—with their excellent service. Wingo's focuses on wings, tenders, and great service in Meridian. Their chicken is hand-breaded and everything is prepared fresh. They have a number of sauce and dry seasoning offerings to suit any taste. Grab a plate full of wings or get a combo for a delicious and filling meal! Mr. P's started as a Memphis restaurant known for their wings, and today they've expanded to several locations—including one across state lines in Southaven. Their sauces are so popular they've started selling them on the side. Try the spicy honey bourbon for a sweet and spicy kick!